If you are a 4×4 off road enthusiast, chances are you love playing in the mud. Just like the old days when we were kids, we always looked for the biggest mud puddle to jump into and for many of us- nothing has changed except for the size of our toys. If you have a 4×4 and enjoy off roading, you probably love to go mud bogging. Mud bogging is simply going off road in the trails after a decent rain. Here are some tips to get the most out of your mud bogging experience. Unfortunately mud bogging can lead to your vehicle getting swallowed up in the mud, so make sure you know the trails before setting out. With plenty of mud, you might not know if the puddle you are about go into is 2 feet deep or 4 feet deep. For many vehicles, anything over about 2 feet can mean you will need a buddy near by to tow you and your vehicle out. If you are unsure just how deep the mud you are about to go into, bring a long stick. Test the deepness before driving through the mud. This will keep the towing to the bare minimum. With mud bogging, the chances of getting bogged down are high, so make sure you ride with a buddy in a second vehicle and have your winches ready. 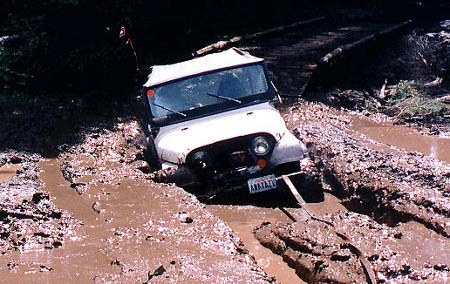 If you don’t have a winch, no big deal, just have a tow rope handy, Just make sure not to use any chains. If the chain breaks you don’t want pieces of metal flying towards you and your vehicle- they are like projectiles that can do big damage. And of course, once you get out of the mud, make sure you wash your vehicle down- even though your vehicle looks mean and muddy, sometimes there are corrosives in the mud that can do damage to your exterior.